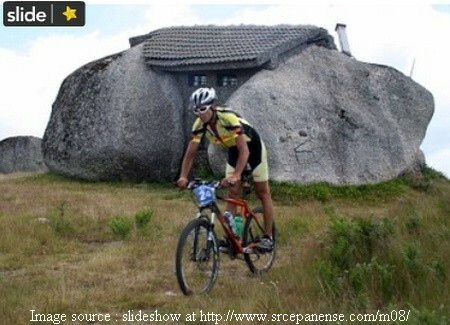 These fantastic images of strange stone house in Fafe, Portugal by Jsome1 were labelled as fake by some doubting Thomases. Main reason cited by them was that a search on the Net displayed only above two images. Being Curious(JM), I posted these images in Fun and Games section of Google Earth Community asking its members to verify its authenticity and if authentic then find location in Google Earth. Some members who frequent the Fun and Games Section are experts in finding needle in the haystack and within hours of my posting, Farrelli, a member from Berkeley, USA not only found another image but also found its location in Google Earth. Australiano, a member from Lisbon, Portugal also confirmed its location. Here is the image, found by him. 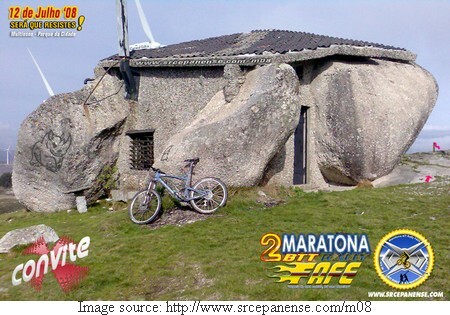 The house is very much real and it seems to be a local icon, as it has been used as a background for the poster for the 2nd BTT Marathon Rally at Fafe - 08 JUL - 12 Jul 2008. Here is an image of the house which I have taken from the slide show of the Marathon Rally. Click on the image to view the slide show. Over all a very satisfactory search for this Stone House in idyllic setting. Acknowledment: Kudos to Farrelli for his efforts in locating it in Google Earth and Special thanks to Jsome1 for sharing these great photos. I'm asian and is unfamiliar with the transport system in portugal. Is there any possibility of me staying over at Fafe and getting a taxi to and fro to this stone house? Currently in Lisbon and unsure if I will go up to explore this location. Im afraid i may get stradded in this place and not be able to get transport back to fafe. I am sorry I have no answer to your query. However since you are already in Lisbon best will be to check with local travel agencies. In case you are able to visit the Stone House, please send me couple of photos and I will be happy to include it here and give due credit to you.